This is the start of a prayer I have sung on many occasions, surrounded by friends and by family and even strangers. Once the prayer is over, the challah is passed around and broken off by hand, a dash of salt added, and eaten. And now, the meal can begin. Friday nights meant roast chicken, roast potatoes, carrots, peas and gem squash. It meant family. But, my favourite part of the challah was for breakfast the next morning. I just love toasted challah. It is sweet, and the only bread I will ever bake with raisins. I am not sure why I can tolerate the raisins in the challah as opposed to any other type of bread, but I do. In fact, even Dave commented last night when I baked the challah that there were raisins in it. As you can see, I did not quite bake my raisin challah long enough so I cut slices off at an angle and turned them into biscotti. They were perfect after that! 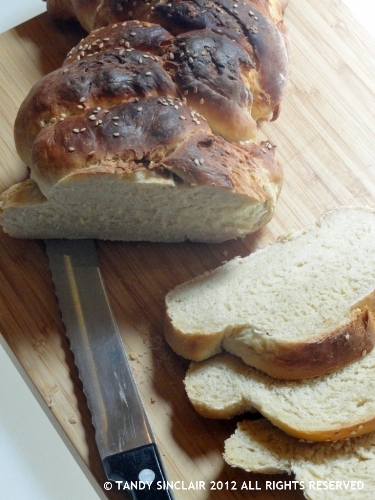 In order for me to blog a recipe, I made another challah. I dusted the second one with sesame seeds. Both are traditional but I would save the sesame seed one for savoury meals. I did thinner braids on the sesame seed loaf which worked out well, but I left it to prove the second time on the counter top, which did not work out quite well when I transferred it to the baking stone. I am learning as I go! do you have a traditional bread you like to enjoy? We have something similar to that in Greece and is called tsoureki! Your bread looks perfect! No traditional family breads here, but I’m hoping I can say there is another few years or so! I have many Jewish friends and admire their traditions. I’ve honestly not made challah bread, but have eagerly received it from my friends. I so agree, toasted is wonderful. I’ll have to try out your recipe and surprise my friends!! I have been thinking of making challah for some time now, think you might have spurred me into action! I am interested to see that you still use citric acid when making bread, this was in favour here some years back and a way of getting a quick single rise but no longer used as the dried yeast now is almost all ‘fast action’. In fact only today a friend was trying to buy some ‘traditional yeast’ and found it almost impossible to obtain. Fresh yeast is even harder to find in shops now. By the way both loaves looked super and yes can well imagine how good it tastes toasted. Wendy. Food memories from times spend with family and friends are so lovely. You did a beautiful job of braiding the Challah. Challah is one of my favorite breads.. I’ve not tried making it but will have to because our baker has stopped making them! What happy loved filled memories Tandy and 2 lovely loves too. Bread baking is very much hit and miss with me – there are some things I can bake and others that just don’t seem to work out – yeast is a tricky thing to work with. One of my favorite bread is Challah and I love making a bread pudding using this too! Your home made one looks and sounds fabulous! I discovered challah a few years ago, and fell in love with its rich flavor and smooth texture. I too like mine with raisins. I think I’ll give your recipe a go next time I bake a loaf. please let me know how it works out! Is beautiful Tandy! I love how you narrate your sabbaths, so cozy and familiar. Tandy what lovely memories you shared with us – bought back memories of meals shared with a now sadlt departed friend and his family. Will have to make this gorgeous bread, say a little prayer and remember. so glad I could help you remember something good! Mmm I LOVE challah bread! Your loaf came out beautifully! Lovely post and recipe!! Thanks, Tandy!! Will try this Tandy. Thank you. I love challah, we have the slightly salted version, with or without sesame seeds but without the milk glazing. Thank you for giving me the idea to bake it myself, have a good week, Tandy! 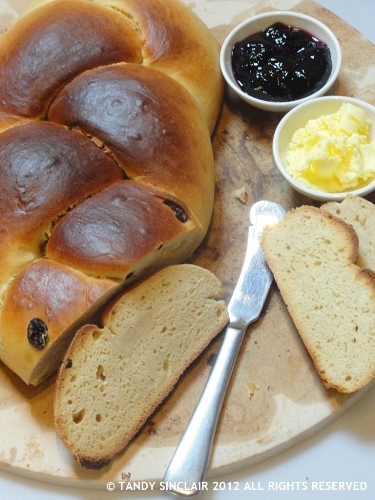 I love raisin bread, in fact I like raisins full stop!